You are here: Home / Newsletter / New Story / Become a Confident Kayaker! 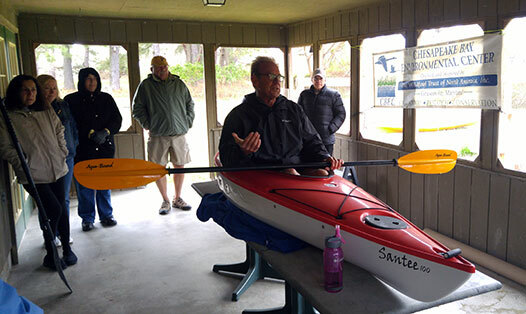 Learn the techniques that let you relax and enjoy gliding through Bay-area waters. 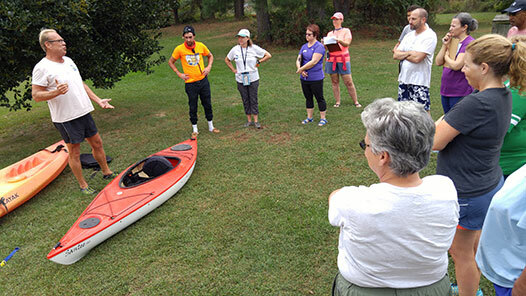 CBEC’s Introduction to Kayaking Class is an American Canoe Association program that teaches the novice how to get out on the water safely, and helps the experienced kayakers hone basic skills. With two ACA-certified instructors and a limit of 10 students per class, the one-day ACA course personalizes lessons, beginning with the question, “What is your goal?” Alternating between dry-land and in-water lessons, students are introduced to concepts and methods before they practice them out on the protected waters of CBEC’s Marshy Creek. You’ll learn trip planning, reading weather conditions, water maneuvers, efficient strokes, sweeps, turns, and pivots; you’ll get tips on how to avoid falling in but also learn how to get back into the kayak if you do fall in. While out on the water, you’re likely to see ospreys, eagles and herons, non-venomous water snakes, river otters, and muskrats. Whether you’re an experienced kayaker looking for a tune-up or a total novice, this course provides the individual attention you need to get out on the water with confidence. The fee for the all-day class is $80 for non-CBEC members, $75 for members. There is a $20 equipment rental fee. For an additional $15, you can be assessed for a skills card, which some outfitters require before you can rent their equipment.